All rainwater catchment systems begin at the roof and gutters. Whether you want to irrigate, supplement, or go for potable (drinking water) usage, you need to remove debris before storing rainwater. It does not matter what type of roofing material you have – all leaves, pine and fir needles that land on your roof will end up in your gutters. 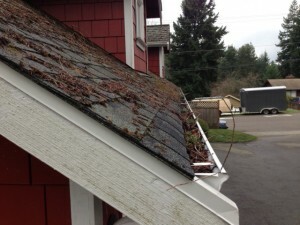 Keeping your gutters clean is a chore most people do not like to do. A good gutter screen is one solution to this issue; it’s advised that it be made of fine mesh stainless steel screen and a solid extruded frame. Gutter screens may be expensive but are worth spending the money on – if you are serious. 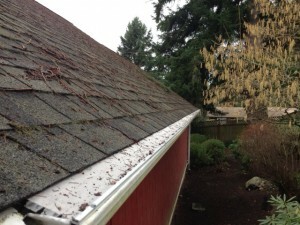 Maintenance is far easier than gutter cleaning; plus the screens are relatively easy to install. Do you want to know some tricks of the trade? Stay tuned and feel free to post questions in the comments area below. Toilet and laundry account for 51% of domestic water usage, which can be very expensive, especially when you are actually flushing it down the drain. You can cut your water bill in half by installing a rainwater collection system like the one RainBank has designed and is currently building in Bellevue, WA. 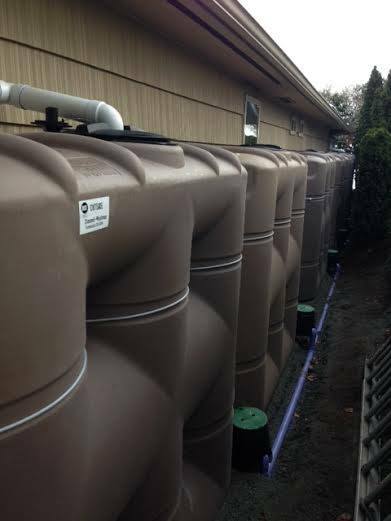 This rainwater harvesting system is a 7,200 gallon buried tank for a newly constructed residence. The four 1800 gallon tanks will provide water for toilet flushing, laundry facility, and some irrigation. The tanks are designed to be buried with three feet of soil on top, putting them out of sight and allowing landscaping to be in place. As a bonus, the stored water can also be an auxiliary supply for firefighting with a simple hydrant. Do you have an old swimming pool that is no longer wanted? That is what this hole was before RainBank’s installation. RainBank is pleased to have designed and installed the first rainwater collection system for potable usage in Seattle city limits. It is supplementary to city water and uses just 3,000 gallons of storage and deionization filtration for collection from an asphalt shingle roof. The deionization filtration system will remove all toxins from the asphalt roof, and bring the pH level to nominal 7.0. 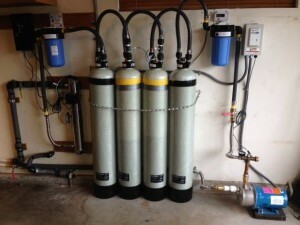 The system will mitigate 65% of the customer’s city water usage. The potable water is of laboratory ultra-pure quality, as proven by samples taken and sent to the lab. The six 530 gallon tanks are a slim line design, enabling placement in a confined area. Have you thought about rainwater collection for potable usage but were deterred because you have an asphalt shingle roof? Here is your answer.